The Infinite is Under Armour’s first attempt at cracking the marathon market: a neutral, pillowy-soft yet stable shoe, designed for a broad range of high-mileage runners. A sensor embedded into the midsole of the right shoe allows you to connect your shoes to your phone via Bluetooth. Tracking your speed, distance, cadence and stride length, your post-run data automatically uploads to Under Armour’s Map My Run platform. The data sent to the coaching feature in Map My Run gives you personalised coaching tips based on your performance. You can calculate your target stride length according to your pace, and read tips on how to improve your running technique. The chip will outlast the life of the shoe and doesn’t need to be recharged, and will update with new technology and features as you update the app – a nice feature. Like other brands on the market, Under Armour have tweaked the design for a gender-specific fit based on their own research into the anatomical needs of men and women. Their biomechanics team in Portland, US, found women’s heels to be shorter and their arches more sensitive, meaning the ladies-version sock liner and tongue are softer and higher. Like all high-mileage shoes, the Infinite has a large outsole, built to take the hammering of a marathon training schedule. The Infinite’s design has thick rectangular pods underfoot, for support, with deep grooves running across the shoe allowing it to remain flexible. Of course, this amount of rubber makes the shoe bulky, but it doesn’t feel it underfoot. To run in, these are similar to the likes of the Asics Gel Nimbus or Brooks Glycerin in their level of neutral, cushioned foam. 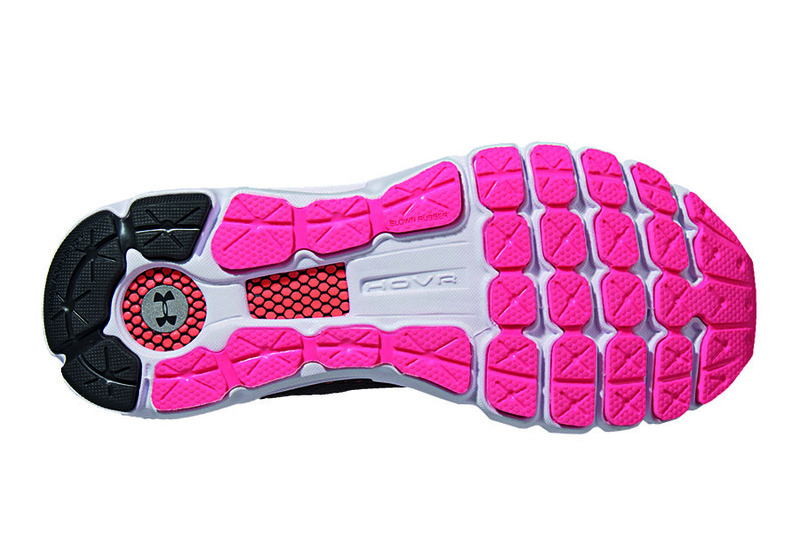 HOVR is Under Amour’s high-energy-return foam, which you can see through the cut-out windows in the midsole. The feel? At first there’s a firmness underfoot, but on the run they feel extremely cushioned as you clock up the kilometres – a good marathon shoe. The thick layer of foam is wrapped in a fishnet-like fabric, which has been designed to limit how much the material can expand when compressed. 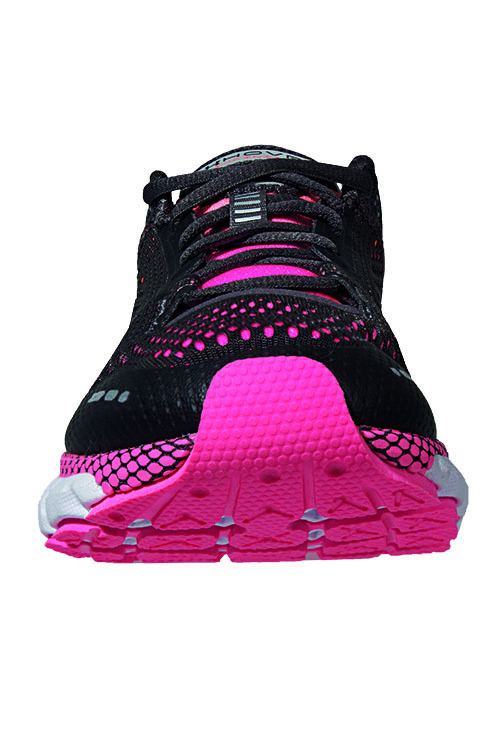 The engineered mesh upper is lightweight and breathable. Watch this space! Under Armour say they’re working on Garmin, Suunto and Apple Watch connectivity.